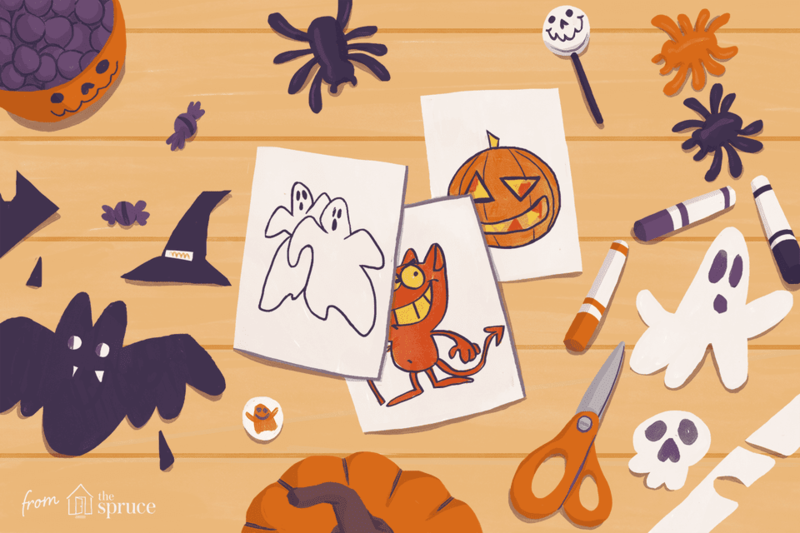 Halloween clip art can spruce up any Halloween project whether you're working on a printable Halloween card, party invitation, newsletter, flyer, or even decorations. These Halloween clip art images are sure to bring your next Halloween project to the next level and you'll have plenty to choose from with all these choices of where to find the free Halloween clip art. There are images of witches, trick-or-treaters, graveyards, and everything in between. Tip: You can find more Halloween clip art images in our lists of free pumpkin clip art and free fall clip art. 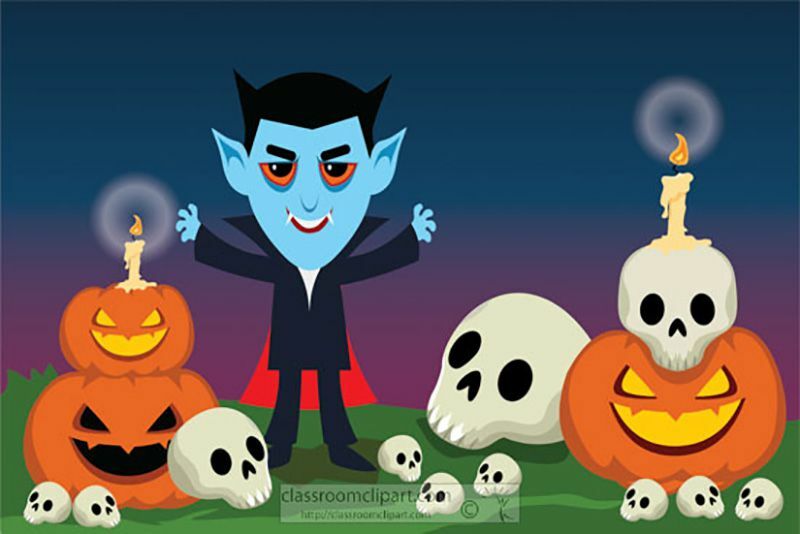 There are numerous pages of free Halloween clip art at Classroom Clipart, adding up to 400+ spooky and fun images. These are large bold images that will add some real interest to whatever Halloween project you're working on. You'll find images of haunted houses, pumpkins, treasure chests, ghosts, witches, cats, skulls, monsters, and more. This website has Halloween clip art as well as some Day of the Dead graphics. There's a good mix of both fun and spooky clip art here so be sure to take a good look around. Be sure to click on the image to get a bigger version before you save it. Hellas Multimedia has got all kinds of free Halloween clip art for you to use. Browse through the categories to see Halloween images of jack o' lanterns, pumpkins, bats, cats, witches, spiders, ghosts, houses, lightning, skeletons, skulls, signs, greetings and more. Clipart Panda has 100+ free Halloween clip art images that include bats, owls, pumpkins, candy corn, Mickey Mouse, ghosts, trick-or-treaters, the moon, cats, witches, haunted houses, monsters, and ghosts. Click on an image and then use the "Download" button to get the full resolution of the image. Some adorable Halloween clip art images await you at Clker.com. There are some great images of pumpkins here with some monsters, ghosts, and trick-or-treaters thrown in. You might even come across the unsuspecting alien! The Graphics Fairy has a great collection of vintage Halloween clip art that you can all download for free. There are vintage images of black cats, bats, pumpkins, snakes, owls, witches, crows, and children celebrating Halloween. An awesome collection of easy to use Halloween clipart waits for you at ClipArtGuide.com. Click on the images once to get the best image to download. They also provide a forum, HTML and myspace code for the images. Webweaver's has 5 fun pages of free Halloween clip art. These are some really fun Halloween images that range from the scary to silly. Be sure to see more Halloween clip art at Webweaver's by scrolling to the bottom of the page. Backyard Gardner has some Halloween clip art, but you won't find any witches, bats or vampires here. The only type of Halloween clip art at this website is of pumpkins! You'll need to click on the image name to be able to get to a page where you can download these free pumpkin images. There are 7 pages of Halloween clip art, gifts, and animations at this website. The HTML code provided makes it easy to put these Halloween images into your website if that's what you choose to do. SpookySites has clip art of pumpkins, jack o' lanterns, skulls, skeletons, monsters, creatures, haunted houses, ghosts, and witches. If you're looking for free Halloween web graphics, SpookySites has animated GIFs and backgrounds as well. There are only a few Halloween clip art images here, but they are large and bold pictures that are going to add a lot to the Halloween project you're working on. There's a ton of categories of other types of clip art here, so if you're looking for something besides Halloween clip art, be sure to check them out. Clipart Graphics has a nicely organized group of free Halloween clip art. Browse through categories of bats, demons, ghosts, spiders, costumes, grim reapers, vampires and more to find just what you're looking for. You'll find some very cute black and white Halloween clip art images at School Clip Art. These are some great images that kids will like. You could even add them to a project and have your child color them in.